exclusive, and first introduced in 1994 with S645 Father Christmas. a handsome French Santa, the 26th nutcracker in this popular series. 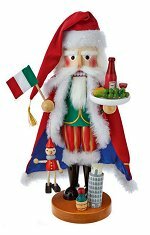 "Christmas Legends" Series This delightful French Santa is dressed in a rich red coat decorated with gold stars. He holds the French Tri-color flag along with a small basket of rich french food and beverage delights. A model of the Eiffel Tower sits at his feet. This French Santa is the 26th Santa in the Christmas Legends series that started back in 1993 - one of the longest running series of nutcrackers. The series first began showcasing period styled Santa's and then transitioned into unique perceptions of Saint Nicholas as seen from around the world! Limited Edition of 5,000 pieces 18-1/2 inches - 47,0 cm 2019 Introduction - 26th in the Christmas Legends Series Made in Germany by Steinbach Volkskunst GmbH Coming Soon - Anticipated Delivery in July You can Pre-Order this item and guarantee that one will be held in your name. "Christmas Legends" Series This handsome Irish Santa is dressed in Rich Blue and Green tartan, with gold embroidery on his coat. This Irish Santa is the 24th Santa in the Christmas Legends series that started back in 1993. He carries bag pipes and has a pot of gold at his feet which contains a music box. The series first began showcasing period styled Santa's and then transitioned into unique perceptions of this gentlemen as seen from around the world! Limited Edition of 5,000 pieces 16 inches - 40,7 cm 2017 Introduction - 24th in the Christmas Legends Series Made in Germany by Steinbach Volkskunst GmbH Sorry - Currently Out of Stock! Please check back in 2019! "Christmas Legends" Series Decked out in traditional red and white fur with gold embroidery on his lederhosen, this German Santa is the 22nd Santa in the Christmas Legends series that started back in 1993. 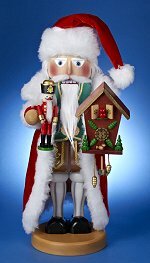 He holds a nutcracker in one hand, and a Black Forest Cuckoo Clock in the other. The series first began showcasing period styled Santas and then transitioned into unique perceptions of this gentlemen as seen around the world! Limited Edition of 5,000 pieces 17 inches - 43,0 cm 2015 Introduction - 22nd in the Christmas Legends Series Made in Germany by Steinbach Volkskunst, GmbH Marienberg, OT Gebirge, Saxony Sorry - Currently Out of Stock! Please check back in 2019!